Jeroen Willemsen is a PhD-researcher at Aarhus University. 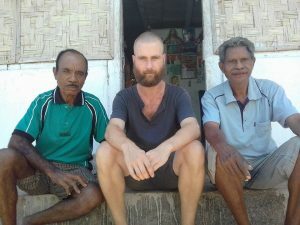 He conducted fieldwork on Reta, a Papuan language spoken in Eastern Indonesia. Besides his work on Reta, he has published on the function and development of applicatives and serial verbs, and is currently writing a descriptive grammar of Reta. 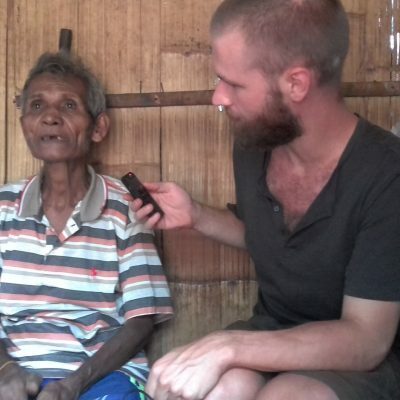 We interviewed him in Aarhus about his experiences as a fieldworker. Can you briefly summarise your descriptive project and the fieldwork you conducted? I went to the Nusa Tenggara Timur region of Eastern Indonesia to describe a language called Reta. It’s mainly spoken in two small villages in the south of the islands Pura and Ternate -not to be confused with the better-known island of Ternate in the Moluccas- between Alor and Pantar. I lived on Pura amongst the Reta people for a semester to document their language. It was a nice project, because we knew virtually nothing about the language – there were only a few word lists. So I really had to document it from scratch, which is a nice challenge. I had always wanted to do fieldwork, but I never knew exactly what type of language I wanted to work on. I was always intrigued by these thick descriptive grammars that we worked with as students, and I always wanted to write one myself someday. At some point during my MA at Leiden University I took a course in Austronesian linguistics taught by Marian Klamer. She introduced me to this group of languages called Alor-Pantar. Unlike most languages spoken in the Indonesian archipelago, these are not related to Austronesian languages. We call these language families Papuan, and you mainly find them in and around Papua New Guinea. And they work very differently from Austronesian languages. I got really interested in those languages, and then wrote my MA thesis about serial verbs in Alor-Pantar language under Marian Klamer’s supervision. It was a pretty nice thesis and fun to write, but what I really wanted to do was actually document one of these languages. So as I was ploughing through all these Alor-Pantar languages, I got quite familiar with the linguistic situation there and noticed that for some languages there was absolutely no material available. And one of those was Reta. So after my MA in Leiden, I applied for money to go to Aarhus University and then just decided to go and work on Reta. As almost nothing was known about the language, I didn’t have much to go at when I first began. So I started eliciting words and simple phrases first, and when I felt confident enough I started doing sentences and gradually got to know the basics. I then started collecting narratives that I transcribed, glossed and translated. I collected oral history such as their local genesis story, but I also recorded ritual speech, simple narratives about every-day things, and epic stories. And I used a lot of so-called stimuli, where you show informants clips or pictures that are designed to provoke a certain response. So you see someone breaking a plate with a hammer for instance, and when they describe that in their language you will then probably know something more about how they express an instrumental relation. And there’s also these picture books like ‘Frog, where are you?’ where informants look at the pictures and tell you the story ‘live’. The nice thing about those stimuli is that you know exactly what it is they are describing. With simple translations you are sometimes a little less sure about what exactly is meant. I think it’s really important to use both elicitation and spontaneous speech. Spontaneous speech provides you with a lot of constructions that you would never find with elicitations, but it also makes you wonder about other aspects of the language. And you start to hypothesise: ‘If you can say ‘adingmi, you might also be able to say ‘angmi’, or something. And then you need to start eliciting again, to see if your hypotheses are correct. So you have to interact with the data. I sometimes read a descriptive grammar that is mainly based on spontaneous speech without much elicitation, and they are often pretty boring. I want to know both what you can say as well as what you can’t say. I basically had a fieldwork shopping list. You know, vaccinations and medicines, recording equipment, gifts. I also had to learn Indonesian to be able to communicate there, which was fun but quite a lot of work. And like all fieldworkers I had to make philological preparations; read up on neighbouring languages and tribes, the area in general, and so on. What was also important was contacting other researchers before I went. That’s actually also important before you decide on a language. They can tell you things you can’t find on the web or in books. Things like which language not to work on, which areas are too dangerous, where and how to find accommodation, what to take and what not to take, what to pay informants, or even how to get to your field site. I got a lot of help from people who were familiar with the area, like George Saad, Marian Klamer, Hein Steinhauer and Laura Robinson. They warned me about things I would otherwise not have known, told me where and how to get started to make my presence known, provided me with a lot of contacts, and basically just encouraged me. I owe them a lot. Ha, well, good question. I think there’s a difference between having enough data and having the right kind of data. A few telling examples of one construction can mean a lot more than a hundred instances of another construction. And it all depends on your purposes too. For the project I did at the time, which was just a grammar sketch, I certainly had enough to write the sketch. More than enough even. But you know, as a linguist you always want to know more and corroborate your hypotheses further. So as you are working on your data, many new questions arise. These questions might not be relevant to your current goals and so in terms of producing a paper or sketch you might have enough data, but it certainly never feels that way. Most of the challenges had to do with the place itself. The people that live in Southern Pura often jokingly mention that they are an unfortunate bunch compared to peoples and tribes nearby. There is no electricity, no road pavement, little vegetation and barely any drinking water. And the heat is indescribable. So it can be quite tough to live there for extended periods of time. I’m not the type to get homesick easily, but what I did notice is that fieldwork can feel a tad claustrophobic. It’s a small village, and you can’t just leave or venture out. If you want to go somewhere, someone will accompany you to make sure you’re safe. They know you might live in a fancy world back home and might be well-educated, but they know all too well that without them you’re absolutely useless there. And they were right actually. The one time I decided to do a bit of rock-climbing on my own I fell on my head. I think you couldn’t fit the blood I lost into a carton of milk. Luckily Reta women all know their way around a needle and thread so they were able to stitch me on the spot. I’m glad you ask, that last bit made fieldwork sound a bit less attractive than it should. Firstly, it’s simply unforgettable to get to know a completely different culture so well. Everything they know and do and talk about is so different. Every day is a new adventure. And they’re so extremely welcoming too. In that sense it’s easily the coolest thing I’ve ever done, and it certainly beats any holiday. And then there’s also the work itself. A language is such an amazing and complex system, for me it’s really like a puzzle that you just want to solve. It’s such an exciting task. I think I underestimated how different the local variety of Indonesian, called Alor Malay, was to Standard Indonesian. So I had spent months learning Indonesian only to find out that I couldn’t understand anyone there, and it took me a while to adapt. There is not much material available on Alor Malay, but I could have sped up the adaptation process considerably by looking at other local varieties such as Kupang Malay, which is fairly similar. And I would have liked to know that certain laptop components can actually melt if the weather’s right. Yes, I’m currently planning a trip back to Pura to work on my grammar. I’ve been working on the language for about a year now, and over the last couple of months I’ve been preparing questions to further my knowledge. I can’t wait to see those people again. If you even consider going on fieldwork, just start contacting people who have been on fieldwork and can tell you more. They are usually more than glad to help you. Fieldwork can feel like a daunting task in terms of getting started and arranging things, but you can really make things concrete and get started by talking to people.